There is one simple quality that we can all develop that can give us a happier, healthier, and more fulfilling life. The quality I’m referring to here is non-judgmental awareness. While at first, it may sound a little confusing really it’s just as simple as breathing, or being present. Being judgmental is deeply ingrained in our social, cultural, and mental habits. It causes us to label things as good or bad, right or wrong, happy or sad, or okay and not okay. In fact, the list of ways in which judgment weaves its way into our lives is endless. Really, judgment is a natural habit of the mind and is dualistic in nature. For everything we think we like, love, or want, there are opposing thoughts of things we dislike, fear, or don’t want. Sometimes we can even have both positive and negative thoughts about the same thing. If you’re currently in a relationship or have had one in the past, then you’ll know that sometimes your thoughts are filled with love and gratitude towards them, while other times it can be quite the opposite. This can be true for anything as the mind loves to move between the positive and negative side of judgment. That’s why people who try to always have a positive mindset in their life are eventually going to come unstuck. For every positive thought, there is a negative thought lurking in the background of the mind. Eventually, these negative thoughts will find a way to rise to the surface of the mind and body. Don’t get me wrong, I’m not saying that positive thinking is a bad thing. That’s a judgment in itself. What I am saying is that you need to be aware that there is a level above both positive and negative thinking and that’s called non-judgmental awareness. This allows you to observe both positive and negative thoughts and feelings without getting attached to them. The fact is that the mind is never going to stop judging every moment of your life because that’s its job. Even comparing yourself in any way, shape, or form to what others be, do, or have, is still judgment. Comparison causes people to judge their looks, their body, or even their circumstances, all of which can lead to things like low self-esteem, anxiety, or even depression. That’s how powerful judgment is. It can cause us to think and feel terrible about ourselves and the world around us. The result being that our lives become more stressful which can potentially cause damage to the health of our mind, body, relationships and quality of life. How To Develop Non-Judgmental Awareness? There is a saving grace though and that is to develop the skill of non-judgmental awareness. 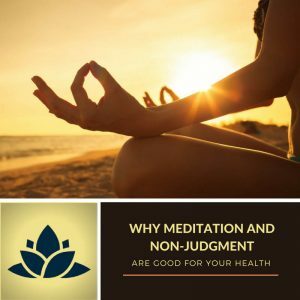 Non-judgmental awareness is best developed through mindful meditation. Once learned, it can easily be applied to any area of your life. Anytime you practice mindfulness you are stepping back from the endless noise of the busy mind and taking the time instead to just notice your thoughts, feelings, or physical sensations. When that happens, then you instantly start to feel clearer and calmer because you are no longer getting sucked into old mental and physical habits. I find that focusing your attention on breathing in and out is one of the simplest ways to focus your awareness on something that is happening that has neither a positive or negative energy attached to it. While you focus on the breath in and out, you may notice the mind wanders. That’s okay, just remind yourself to come back to observing the breath. When we practice being mindful of the mind and body with an attitude on non-judgment it becomes easier to be more accepting of what goes on around us. As that happens the things that people used to say or do that annoyed you suddenly become easier to tolerate. Or, things that may have stressed you out in the past start to have less power to control how you think and feel. Living with non-judgmental awareness is something that gets better with practice. Ideally, you’d do at least 20 minutes a day of sitting and watching your breath move in and out of your body. You can even put your hand on your belly and feel it rise and fall as you breathe in and out if that helps. Whatever mindful meditation you decide to do make sure to practice it every day. It’s actually quite a natural thing to do because being mindful means you are being present. When we are present then we are less likely to get sucked into the mind games of our past or future thoughts. If the mind is left to its own device it will always swing between positive and negative thoughts and feelings. This then affects our mood, energy, productivity, decisions, and results. That’s why when you choose to adopt a mindful approach to living you get the chance to make inner peace a bigger part of your everyday life.